This is our Clove Bud Steam Distilled Essential Oil. Herbal Folk Traditional uses for Clove Bud include combat bad breath, cavities, dental anesthetic mouthwash and gargle, infections in in the mouth, mouth ulcers, nausea, sore gums, toothache, throat infections and vomiting. 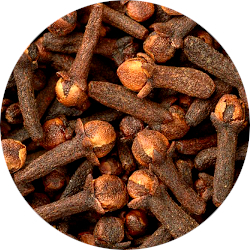 Clove Bud is commonly used in spicy perfumes and for imparting richness to almost any perfume! It has a rich, sweet-spicy, warm scent with a fruity top note. Clove Bud blends well with Allspice, Basil, Benzoin, Bergamot, Black Pepper, Cardamom, Carnation, Cinnamon, Cistus, Clary Sage, Elemi, Fennel, Geranium, Ginger, Grapefruit, Jasmine, Lavender, Lemon, Lemongrass, Litsea Cubeba, Myrtle, Niaouli, Nutmeg, Orange, Oregano, Palmarosa, Peppermint, Ravensara, Roman Chamomile, Rose, Rosemary, Tangerine, Thyme, Vanilla and Ylang Ylang. Clove Bud essential oil should be used highly diluted adding drop by drop to your blends until the desired effect is achieved. Approximately 1 drop per 1 fluid ounce of carrier oil is considered an appropriate dilution for safe topical application. Safety Considerations: avoid in cases of major surgery, peptic ulcer, hemophilia or other bleeding disorders and on children less than 2 years of age; drug interaction, may inhibit blood clotting, embryo-toxic, moderate risk of mucous membrane irritation, moderate risk of skin sensitization. A maximum dermal use level of 0.5% is recommended based on eugenol content. A patch test should be performed before use by individuals who have sensitive skin. Clove Bud Essential Oil uses include and are not limited to aid digestion, antiseptic, flavoring agent, insect repellent, massage oil, perfumery, skin care, soap ingredient. Clove Bud Essential Oil has the following actions: anti-fungal, antimicrobial, antiseptic, antiviral, aphrodisiac, digestive and expectorant.